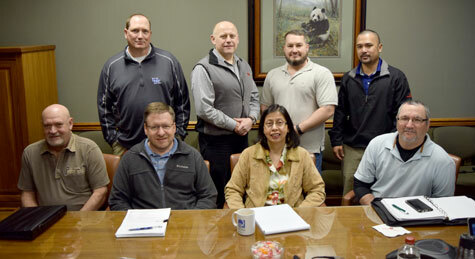 Recently, eight employees from Strongwell’s Virginia Operations underwent a Lean Six Sigma Green Belt transformation led by Nelson Teed, Executive Director of the Manufacturing Technology Center in Wytheville. Since 1994, the Manufacturing Technology Center has been helping advanced industry in southwest Virginia. The 12-week Lean Six Sigma Green Belt Project Support Course offered DMAIC (Define, Measure, Analyze, Improve and Control) simulations using a “train-and-do” approach. Participants were grouped in pairs to complete a job-related project which utilized their Lean Six Sigma Green Belt training to deliver a measurable impact. Participants created team charters, utilized analysis tools common in Six Sigma such as Pareto Analysis and Ishikawa diagrams to identify waste and seek process improvements. Mark Haynes (Manager Virginia Operations Logistics & Highlands Manufacturing) and Harley Stanberry (Shift Supervisor-Highlands) studied older pultrusion machine designs and found ways to yield greater processing efficiencies while also reduce future machinery footprints through more compact machine designs. Gloria Wadle (Quality Assurance Engineer-Bristol) and Billy Phillips (Fabrication Superintendent-Bristol) completed a project on increasing tool capabilities reducing operational inefficiencies on some of Bristol’s automated fabrication machines. Doug Edwards (Manager of Shipping and Receiving-Bristol) and Rudy Hess (Shift Supervisor-Highlands) completed a study and project on reducing ladder rail scrap rates in Highlands, Mexico and Bristol. Doug Edwards commented on how, even though this project focused on a particular process in pultrusion, he saw multiple opportunities to utilize process capability or CPK outcomes within the shipping department he oversees. Bill Harlow Jr. (Pultrusion Shift Supervisor-Bristol) and John Thompson (Shift Supervisor-Highlands) focused on improving standard shape production via better machine design. They were also able to identify and control some key external factors affecting machine production through high volume runs. Over the course of 12 weeks, these four project teams’ findings yielded significant overall operational and materials costs savings for Strongwell operations. The team members’ hard work earned them community college continuing education units (CEU’s) with the option to test for green belt certification.